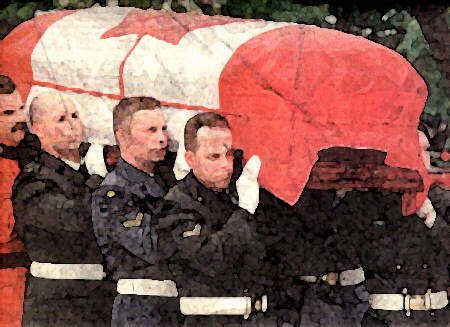 A long-lost son came home [to Canada Thursday May 25, 2000] for a national wake and a military funeral. An Unknown Soldier, buried in France for more than 80 years, was placed in the Hall of Honour of the Parliament Buildings, to lie in state until a formal military funeral on Sunday. Gov. Gen. Adrienne Clarkson and Prime Minister Jean Chretien placed wreaths before the coffin as war veterans looked on with bowed heads. The soldier rode to Parliament Hill on a motorized gun carriage, escorted by an honour guard of soldiers and Mounties. As the procession entered the grounds, the Peace Tower bell began a mournful tolling. The remains were turned over to the Canadian military Thursday in France in a solemn ceremony beneath the twin-towered Vimy Memorial dedicated to 66,000 Canadians who gave their lives in the First World War. All told more than 110,000 Canadians have perished in conflicts through the country's history. 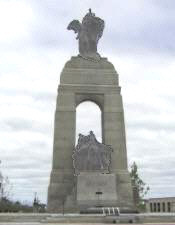 On the Vimy monument, a sculpture of a hooded woman representing Canada stands brooding over her war dead. "Dear God, we receive the remains of Canada's Unknown Soldier as a holy trust," Brig.-Gen. Murray Farwell, the chaplain general, said in a prayer as the remains were placed in Canadian care. The soldier had been buried under a gravestone bearing a Maple Leaf and the inscription: Known Unto God. It is rare for the Commonwealth War Graves Commission to grant permission to exhume a grave, and Canada had to agree never to try to identify the soldier before his remains could be brought home. On Sunday, the nameless, homeless, rankless soldier was be carried to his final resting place in a hand-hewn tomb of dark Caledonian granite at the foot of the National War Memorial. "Today is a solemn and moving moment in the history of our country," Defence Minister Art Eggleton said after a flag-shrouded coffin was carried from a grey military Airbus. He said the soldier "will forever represent the Canadian sacrifice for the restoration of peace and the defence of freedom in the past, the present and the future." The soldier symbolizes 27,000 comrades who have no known graves. Said Eggleton. "Although we know who they are, we know not where they lie:"
On Sunday, [he was borne] through the streets of Ottawa on a century-old gun carriage drawn by four black RCMP horses. Honour guards with rifles reversed in mourning marched in front to the slow beat of drums muffled by black cloth. Minute guns boomed 21 times as the procession moved between lines of silent onlookers. Hundreds of veterans stood by the monument as the pallbearers - army, navy, 'air force and Mounties - positioned the silver maple coffin over the hand-hewn, Caledonian granite sarcophagus. It was draped in the Maple Leaf flag that this soldier never knew, a flag which, without him and his comrades, might never have been. "To every thing, there is a season, and a time for every purpose under heaven:' Buglers from the Royal Hamilton Light Infantry sounded the Last Post; the silver notes echoing and re-echoing over the square. After two minutes of silence, a lone piper skirled a Lament for the Unknown Soldier and four CF-18 fighter-bombers screamed overhead, one pulling up and away to leave a gap in the "missing man formation." 'They shall not grow old, as we who are left grow old. Age shall not weary them, nor the years condemn. At the going down of the sun, and in the morning. We will remember them. Legion members filed past the tomb with bags, boxes and urns to pour in a bit of soil from each province and territory, as well as soil from Vimy in France. The Unknown will lie in the soil of his homeland and that of the land where he died. Grand Chief Howard Anderson of the Gordon's Reserve north of Regina, poured in a mix of tobacco and sweet grass and added a ceremonial eagle feather. A traditional three volleys was fired by a lining party as the coffin was lowered. The grave was left with a temporary cover. It will be sealed with a granite lid, decorated with bronzes by sculptor Mary Ann Liu. The tomb is marked simply: "The Unknown Soldier, Le Soldat Inconnu." The material used in this article was gathered by Great War Society Member Joyce M. Kennedy, author of Distant Thunder: Canada's Citizen Soldiers on the Western Front. Several newspaper features were drawn upon most notably those of the Saskatoon, Saskatchewan Star Phoenix.